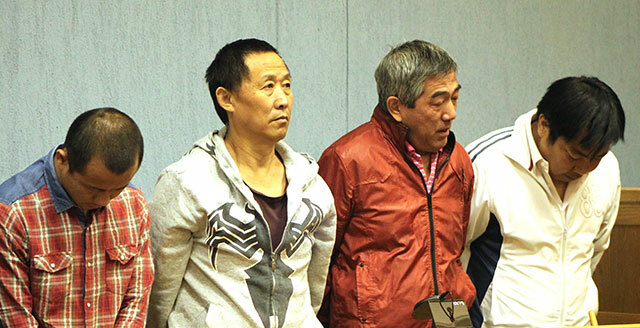 JAILED … Wildlife contraband smugglers Li Xiaoliang, Li Zhibing, Pu Xuexin and Wang Hui (left to right) in the dock in the Windhoek Regional Court during their trial in 2016. Their sentences were increased to an effective 15 years imprisonment each on Friday. AN IRON fist should be used against people who commit crimes against endangered wildlife in Namibia, a judge commented in an appeal judgement handed down in the Windhoek High Court on Friday. In a judgement in which an appeal by four Chinese citizens against a conviction on a charge of attempting to export controlled wildlife products from Namibia unlawfully was dismissed, judge Alfred Siboleka said in his view, people caught trying to smuggle rhino horns out of Namibia were guilty of inflicting the worst kind of economic setback a foreign or local national could commit on Namibian soil. “If this subtle onslaught is not tackled with an iron fist, irreparable damage to our wildlife is inevitable and certain,” he stated. The judge also remarked that rhinos were peaceful animals, and that nobody would have a reason to shoot at them except for wanting to export and trade in their horns. He made the comments in a judgement on an appeal that Wang Hui, Pu Xuexin, Li Zhibing and Li Xiaoliang lodged in the High Court after they were convicted in the Windhoek Regional Court of having attempted to illegally export 14 rhino horns and a leopard skin from Namibia in March 2014. Judge Siboleka, with judge Dinnah Usiku in agreement, not only dismissed the appeal against the men’s conviction, but also ruled that they should have been found guilty of exporting controlled wildlife products, and also of unlawfully acquiring, possessing, using or taking out of Namibia the proceeds of unlawful activities. The two judges further increased the prison terms that the four men will have to serve. The four men’s trial ended with all four of them being sentenced to 14 years’ imprisonment, with two and a half years of that jail term suspended for five years for the two Lis and Pu, while two years and four months of Wang’s sentence were also suspended. That left the two Lis and Pu with effective jail terms of 11-and-a-half years, while Wang had a prison term of 11 years and eight months to serve. In the appeal judgement, though, judge Siboleka replaced the sentences with one of 20 years’ imprisonment, of which five years were conditionally suspended, resulting in an effective jail term of 15 years for each of the four men. The court ordered that the sentences be backdated to 30 September 2016, which was the date the four men were sentenced in the regional court. The two Lis and Pu were arrested at Hosea Kutako International Airport on 24 March 2014, after 14 rhino horns and a leopard skin had been discovered in two suitcases that the two Lis had booked onto a flight with which they and Pu were to leave Namibia. Wang was arrested in Windhoek in May 2015. Judge Siboleka noted that closed-circuit camera recordings made at the Windhoek hotel where all four of the men had been booked in on the night before the two Lis and Pu were scheduled to leave the country clearly showed that the four operated as a group, and that they together handled the suitcases in which the rhino horns and leopard skin were later found. Although the two suitcases were booked onto a flight in the names of the two Lis, they were transporting the suitcases on behalf of their group, which included Pu and Wang, the judge reasoned, noting that Wang had also paid for his three compatriots’ air tickets back to China. Defence lawyer Sisa Namandje represented the four men when arguments on their appeal were heard in December last year. Prosecutor Simba Nduna represented the state.